"Insider trading is hard to prove. To be convicted, a person must have bought or sold a stock based on material information that is both unknown to the general public and likely to have had an important effect on a company's stock price." Cash Budget: A statement of Inflow and Outflow of Cash which shows the monthly surplus or deficit. 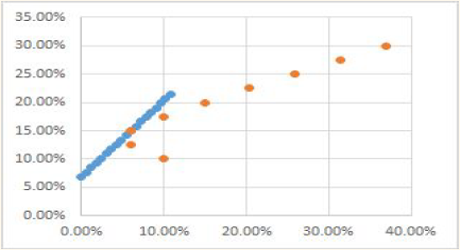 This article explains the MArkowitz efficient frontier curve, Capital Market Line and the strategies investors can use to profit from this research conducted in 1952. How to Correctly measure returns and form an expectation for the future? Investors often wonder about the rosy claims made by a Mutual fund house about the returns they were able to earn. There are many ways to measure returns. Arithmetic mean returns based on Discreet compounding,Geometric mean returns based on Discreet Compounding.Arithmetic mean returns based on Continuous compounding and Geometric mean returns based on Continuous Compounding.The below table illustrates how a Fund manager can use Discreet Returns and that too arithmetic mean to show he performed better. On the Investment in WIPRO for a period of seven years he can claim 32.76% returns. An Investor must assess the performance of his investment using Continuously Compounded rate of return because it is time consistent and additive. Thus under this strict standard the Geometric Returns are only 11.45%. While assessing historical performance of an investment use continuously compounded Geometric mean. This is the toughest measure. You must also consider the risk adjusted performance measure but that is a subject of discussion we will address another time. Rs 100 grew to Rs 407.84 in 7 years at a CAGR of 22.24% which means that the GM is a better indicator of historical performance whether the returns have been calculated under Discreet or Continuous Compounded method.